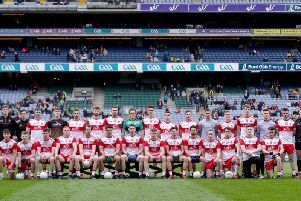 Tyrone moved into their second All Ireland semi-final in three years thanks to a 0-18 to 0-14 victory over Monaghan on Saturday. The Red Hands were full value for their victory, dominating the game from midway through the first half, as they held Monaghan at arms length to claim the win. The opening ten minutes were evenly balanced with the sides trading scores, Connor McAliskey and Joe McMahon on target for Tyrone and Kieran Hughes and Dessie Mone on target for Monaghan. Tyrone began to get a grip of things as the game settled down, their defence proving difficult for Monahgan to break down, while up front Darren McCurry and McAlsikey were proving a handful. The Red Hands eventually took a 0-7 to 0-5 lead at the break a couple of Conor McManus points late in the half keeping Monaghan in touch. Three points early in the second half from McCurry and McAliskey were described as ‘crucial’ by Mickey Harte after the game and it was hard to argue with him, as they gave Tyrone a five point cushion. While Monaghan did close the gap due to the efforts of Owen Duffy and McManus, they could never close the gap to any more than three as points from Ronan McNabb, Ronan McNamee, Sean Cavanagh and the corner forward pairing of McCurry and McAliskey kept Tyrone in charge. Late frees from McManus and Paul Finlay reduced the gap to three before Mattie Donnelly hit two late points to seal Tyrone’s semi-final progress. There were late red cards for Ronan McNamee from Tyrone and Monaghan pair Darren Hughes and Paul Finlay.